We all know that to get bigger muscles, you must build –gain—more muscle protein. No food or nutritional supplements – (including glutamine), can actually produce a net gain in muscle protein by itself. Science knows that several quality mixed blend nitrogen protein sources actually facilates increased storage of structurally building proteins into type-2 (fast) hypertrophy muscle tissue. Exercise (especially resistance training) and hormones (especially testosterone and growth hormone) assists the processes and there are specific amino acids like glutamine and the BCAA group (especially leucine) which really augment and increase the muscle acquisition processes. This is now proven! Protein maintains the muscle protein that you stimulate the synthesis of with your workouts. Can You Exercise Your Metabolism with Glutamine Supplements? Glutamine supplements are absolutely critical in the nutritional plan for anyone building muscle or losing fat. Basically, this involves using glutamine as an energetically ‘costly’ source of glucose –a means of ‘exercising’ your metabolism, as I refer to it in my dieting article in this issue. Let’s review the basics. If glucose is your body’s favorite fuel (and it is), then glutamine is your body’s favorite amino acid, or very nearly so. Your muscles, for instance, have been estimated to release nearly 10 grams of glutamine each day! As I’ve explained elsewhere, one of the key functions of glutamine is to serve as a source of glucose. Hence the term glucogenic (‘glucose-generating’) amino acid. Glutamine and alanine are the two most important glucogenic amino acids, with more glutamine being used to make more glucose than even alanine does! (Alanine is a non-essential amino acid and it is not required via nutrition whereas glutamine is a conditionally essential amino acid and is in very high demand during training, stress and illness). This is a process by which amino acids and other non-glucose precursors are turned into glucose and because of low carb and low fat diets, bodybuilders use it a lot! I mean a lot! It doesn’t come for free. Gluconeogenesis is biochemical work fueled by the burning of fat (fatty acids). (Hankard et al. 1996) showed that glutamine could increase the calorie-burning rate of healthy subjects by 17% when it was infused into their guts. I believe that at least a portion of this could be attributed to the conversion of glutamine into glucose, i.e., gluconeogenesis. I favor a lower-carbohydrate, higher-protein diet for the purpose of staying lean and hard while slapping on new muscle tissue. Glutamine can be of value for higher-protein/lower-carbohydrate eaters such as myself by serving as a ‘non-carbohydrate’ means of re-fueling your body (e.g., liver and muscle glycogen replenishment), with a fat-burning ‘kick’ to boot (i.e., stimulation of gluconeogenesis and associated increased oxidation of fatty acids). Thus, by adding glutamine to your post-workout protein shake instead of carbohydrate, for instance, you effectively replenish your body’s glucose economy, but in a way that actually stimulates the burning of fat as opposed to reducing it (i.e., as eating carbohydrate normally tends to do). Additionally, one of the inner signals to stimulate growth or to cause a mechanical signal to the muscle to result in biochemical growth is the influx-efflux of glutamine in and out of the muscle cell. It seems to build muscle that your body draws glutamine from varying body sites and Dr. Connelly postulated that using glutamine in substrate cycling, (providing constant glutamine to the system would result in constant signals to build more muscle without robbing glutamine from the gut and it appears he was right and way ahead of the game (I mean way ahead). 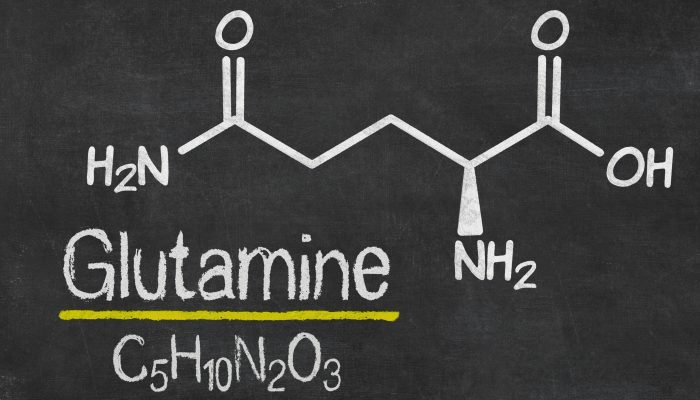 How much glutamine should I take to ‘exercise’ my metabolism? There is scant, if any, scientific evidence, to show that protein-bound glutamine is superior in absorption to free-form glutamine. In fact, Boza et al. (2001) showed that they are both absorbed equally well, stating, “The results clearly show that oral administration of free glutamine and protein-bound glutamine…are equivalent.” However, free-form glutamine does pose stability problems. Free glutamine has an unfavorable chemical property that hampers its use in routine clinical ready-to-feed enteral formulas, namely, instability, especially during heat sterilization and prolonged storage. In other words, don’t mix free form glutamine with hot liquids or leave it sitting around in solution for too long. Five to eight (5-8) grams of glutamine consumed post-exercise has been shown to enhance both liver and muscle glycogen re-synthesis (Bowtell et al., 1999). In her review of glutamine, exercise and the immune system Castell (2001) notes “At rest, the ingestion of 5g glutamine increases the p[Gln] [plasma glutamine] approximately 2.5-fold for about 2 hours. Given that 50–60% of dietary glutamine is used by intestinal cells, unacceptably high amounts of glutamine would have to be consumed orally to have an effect on muscle levels in athletes.” (Emphasis mine). Likewise, I have to disagree with Castell on the last point, though ‘unacceptably high’ is clearly a subjective comment. Why do I disagree? Here’s one reason: (Bruce et al. 2001) gave healthy, trained cyclists 0.125 grams of glutamine per kilogram of body weight dissolved in 5 ml/kg body weight of an artificially sweetened solution. This resulted in an increase in plasma glutamine concentrations of over 50%. One hour after taking the glutamine, an increase in muscle glutamine contents was detected (yeah!). I weigh about 210 pounds, or 95.4 kilograms. Using Bruce et al.’s dosage would provide me with 0.125 grams X 95.4 = about 12 grams. I’ve taken much more glutamine than this in a single dose without any ill effects, as have many others like me. My Advice: Take 0.125 grams/kg body weight after your workouts. Or, as Jeff says for the trainees who are NOT mathematicians like Rob! Take the above supplement as they recommend in their label!